Is the Hyundai Elantra too Good to be True? We’ve all heard it! The pros of every new vehicle on the market. 2018 Hyundai Elantra for your expeditions. have you riding in style and noticed favorably at any event, too. 2018 Elantra beats most of its peers in gas mileage, right? Does the Hyundai Elantra still seem too good to be true? Well, it’s not! and to take a Elantra test drive! Hyundai Grand i10 range has been updated … and we drove the popular city car at launch through the Cape Winelands. Well, yes … it does. That’s because 99% of it is exactly that. On the outside, on this range-topping Glide derivative, it’d be daytime running lights. And on the inside … well, nothing’s new. Other than the fact that some equipment that was optional before is now standard. We’re talking more a model-year change than actual facelift here. Got it. And this, you say, is the top-spec model. What do I get as standard now? Yes, the Glide replaces the Fluid at the top of the Grand i10 line-up and you get such conveniences as height-adjustable seats and seatbelts (though the steering remains rake-adjust only), electric folding and heated side-mirrors, electric windows front and rear, rear parking assistance and Bluetooth connectivity with steering wheel remote controls. As standard, the Glide now also offers leather upholstery (although doubts remain as to how many cows were harmed in its making) and light-red inserts on the instrument, centre console and door panels, which I must say, do add a little welcome flair. There’s also an infotainment system with a full-colour touchscreen, the daytime running lights mentioned earlier, and a two-year/30 000 km service plan to go along with Hyundai’s five-year/150 000 km warranty (plus an additional two-year/50 000 km powertrain warranty). And you get all that for exactly the same price as the outgoing Fluid derivative. And it ticks all the essential safety boxes as well? Indeed it does. In fact, all derivatives in the range now features dual front airbags, along with ABS, although it still does not come equipped with Isofix child seat points on the rear bench. In terms of spec versus price, it must be said, this i10 Grand is tough to beat in its segment. No changes to the drivetrain either, I take it? Nope. 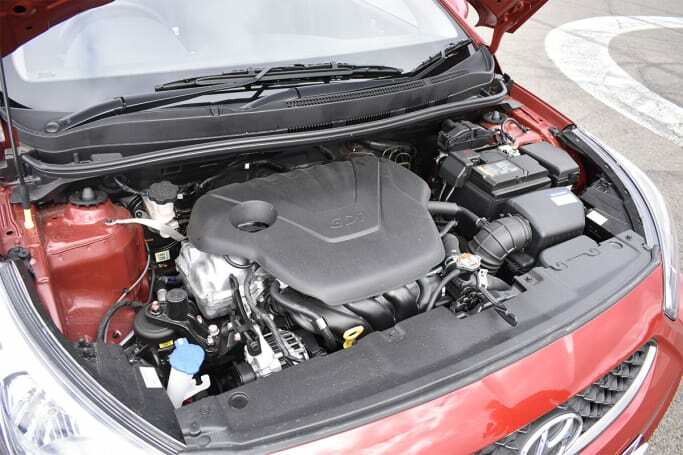 Under that little bonnet is still Hyundai’s familiar 1,25-litre unit from the “Kappa” engine family. Its outputs remain the same, delivering 64 kW at 6 000 r/min, with a maximum torque delivery of 120 Nm at 4 000 r/min. It’s reasonably perky. Look, a 12,2-second 0-100 km/h time isn’t exactly quick, but I had a passenger with me on the launch and, with the transmission’s five-speed manual allowing me to hook into the ideal rev range, it never felt sluggish. That said, up at altitude, and with a couple more people in the back, this naturally aspirated four-cylinder unit might struggle a little. Hyundai claims a fuel consumption of 5,9 L/100 km, but around 7,0 L/100 km is a more realistic everyday figure. The ride is quite soft – as is appropriate for a car in this segment – but not wallowy. The Grand i10’s MacPherson strut front suspension, helped by the electrically assisted steering, provides accurate turn-in, while the rear torsion beam suspension set-up, bolstered by improvements to the trailing arm geometry and coil springs, provides predictable enough handling characteristics. But small, sharp road imperfections – often the nemesis of such a suspension system – are felt through the cabin … but again, at this price-point, that’s par for the course. Seems like a decent little car then? It is. And, as ever, South Africa's highly knowledgeable motorists know it, too. Last year, Hyundai sold a combined total of 8 342 basic i10s (this line-up has now effectively been scrapped) and Grand i10s in our market and, with this updated range and the addition of a well-priced 1,0 version, the local distributor hopes to push that figure close to the 12 000-mark in 2018. The Grand i10 from Group 1 Hyundai 1,0 Motion manual replaces the old 1,1 Motion and it comes with the same naturally aspirated 1,0-litre found in the Kia Picanto. There’s also an auto version (according to Hyundai, around 30% of recent i10/Grand i10 sales have been autos). The 1,0 is pretty well-specced for the price and, most importantly, comes with ABS and dual airbags. You also score electric front windows and steering wheel controls with Bluetooth and an integrated microphone. Plus, it’s R5 000 cheaper than the 1,1-litre model it replaces, and that had only a driver airbag and no fancy steering wheel. The 1,0 model seems to be flying off dealership floors, too, with around 630 units finding new owners in January alone. The current generation of Hyundai’s smallest hatchback, the Accent has been on sale since 2011 and despite facing stiff competition from newer models, it remains the best-seller in the light car segment. How does a hatch that’s changed very little over the years continue to sell well in a market, which continues to get tougher? I set out to find what’s appealing about it. A decent multimedia system is essential for keeping yourself and your passengers entertained during the journey. 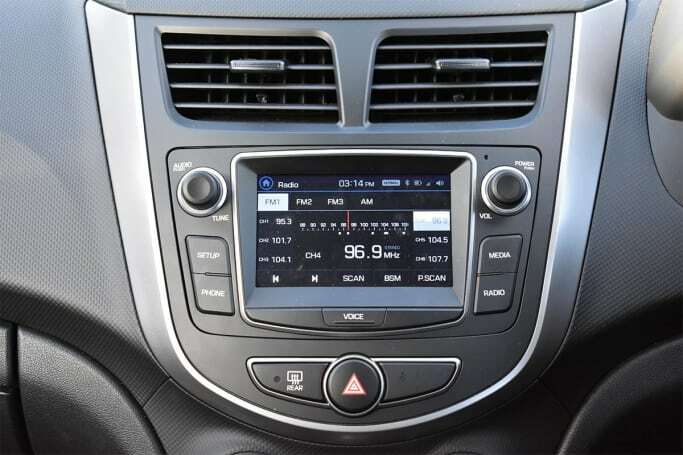 In the Hyundai Accent for sale, you’ll find a small 5.0-inch touchscreen with Bluetooth and Apple CarPlay. If you’re a Samsung user (like myself) you’re left wondering where the Android Auto is? Android Auto is available, but needs to be requested at the dealer which will perform a 15-minute software upgrade to unlock this feature. Rear parking sensors are an optional extra, whilst there are some great standard features such as the noise, vibration and harshness (NVH) levels inside the car. During my trip very little road noise infiltrated the cabin and having driven several of the Accent's rivals, it’s one of the quietest of the bunch. Another positive is the 1.6-litre engine. The four cylinder produces 103kW/167Nm, which in this class, feels like a Ferrari. Unlike some small cars, the Accent doesn't feel out of its comfort zone on the highway, there’s enough power throughout the rev-range to make overtaking easy. Connected to the engine is a six-speed (torque converter) automatic with manual shifting. Last year the base model Accent was fitted with a Continuously Variable Transmission (CVT) auto, while the torque converter was reserved for the top-spec SR model. As Hyundai has trimmed the range down to just the Sport, the CVT has been dropped in favour of the traditional auto while there’s also an optional six-speed manual. There are four-wheel disc brakes compared to the usual combination of front discs and rear drum brakes of the competition. The Hyundai Accent for sale is best suited to driving through city streets and busy shopping centres. The Accent’s small size allows it to fit into tight spots. The steering can feel heavy when switching from Reverse to Drive, but the rest of the time it’s light. Walking back to the Accent with groceries in hand was a reminder that the exterior styling is splendid. What is attractive about the Accent is a boot that makes objects disappear like a magician’s pocket. 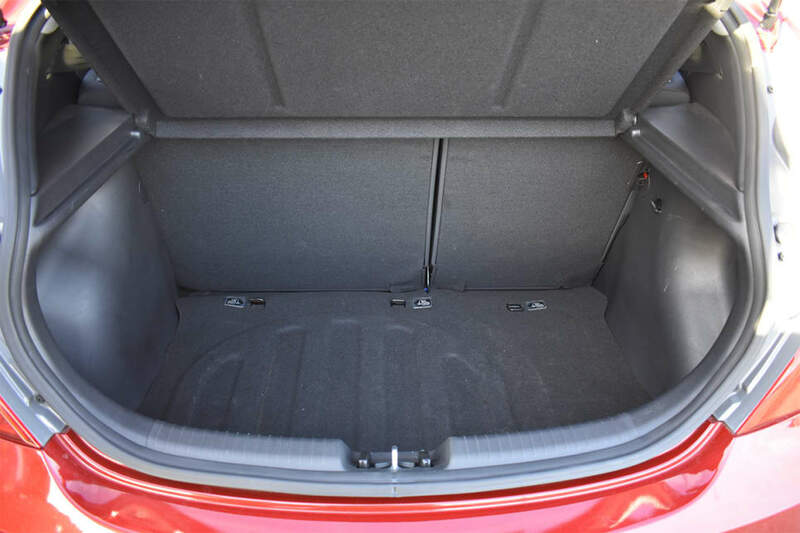 There's 370 litres (VDA) of load space on offer in the Accent, enough to easily swallow my shopping and a massive bag of clothes ready for the charity collection bin. As already mentioned, the Accent range consists of one car, the Sport, which is available as a hatch or sedan, at Group 1 Hyundai. One plus for the Accent is the full-sized alloy spare tyre. 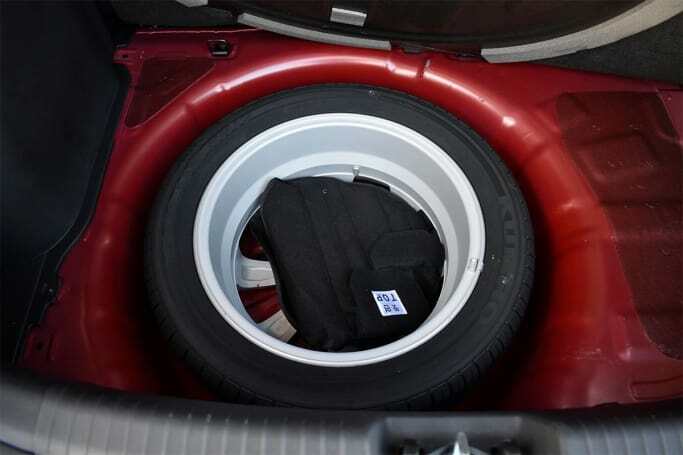 The only other car in this class with a full-sized spare is the Volkswagen Polo, but that’s a steel wheel. The official average fuel consumption for the Accent auto is 6.6L/100km. Hyundai’s smallest hatch has a zippy engine, a comfortable interior and loads of boot space. These are the reasons the Accent Sport is still the best selling car in the light car segment. The Hyundai Creta is India’s best selling SUV longer than 4 metres. 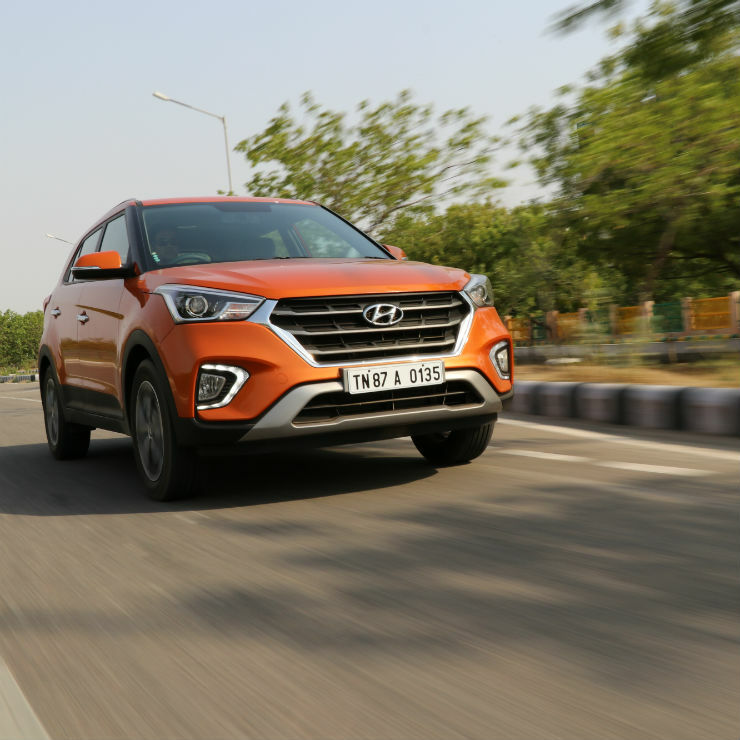 Despite being around since 2015, people are still heading to Hyundai showrooms in droves to purchase the Creta. 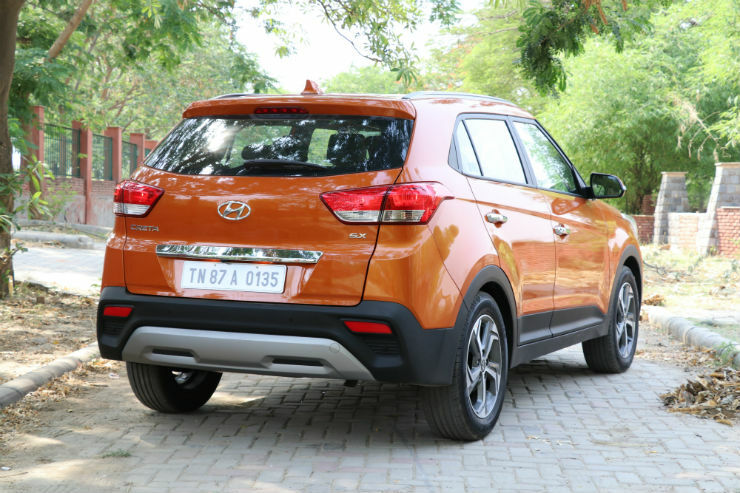 So why is it that everyone is still buying the Hyundai Creta? Here are seven reasons. Over the years, Hyundai has kept the design of the Creta as fresh as possible by launching special edition versions of the SUV from time to time. The facelift launched in May 2018, refreshed the design, bringing the Creta more in line with Hyundai’s current design language with the signature cascade grille, new projector headlamps and revised bumpers. Also new are the Marina Blue and Passion Orange colour options along with the all-new Dual Tone Passion Orange and Black option. Hyundai has ensured that Creta looks the part of an SUV and it sits right while not going overboard with the styling. This has really appealed to customers, who prefer its restrained yet likeable design. 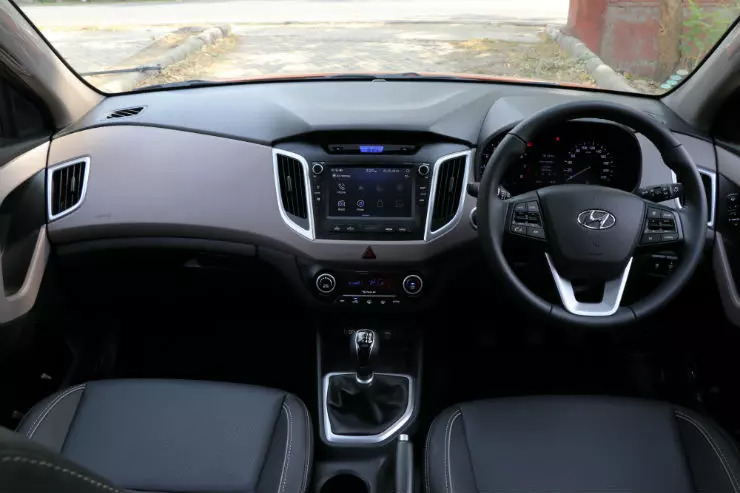 The new Hyundai Creta comes packed with a host of spectacular features including a panoramic sunroof, 6-way electronically adjustable driver seat that also gets height adjustment, smart key band, wireless phone charge, speed sensing auto door lock, sliding front armrest and cruise control. The car also gets a new touchscreen infotainment system with Apple CarPlay, Android Auto and MirrorLink, apart from Hyundai’s own iBlue Audio Control App. The facelifted Creta offers revised interiors and a dual-tone interior theme option. The upholstery is made of premium materials, which is appealing to potential owners. Another addition to the interior includes a new and larger 7-inch infotainment display on the centre console. Owners can opt for a new Tangerine Orange interior colour pack to make the cabin more attractive. The Hyundai Creta is offered with three engine options – one petrol and two diesels, all of which offer a mix of power and fuel efficiency. The single petrol is a four-cylinder 1.6-litre unit that cranks out 122 Bhp @ 6,400 rpm and 151 Nm @ 4,850 rpm. The engine comes paired to either a manual or an automatic gearbox both of which offer 6 speeds and returns a mileage of 15.29 km/l. The smaller diesel engine is a 1.4-litre turbocharged unit that cranks out 89 Bhp @ 4,000 rpm and 220 Nm of torque @ 1,500 rpm while returning a mileage of 21.38 km/l. The 1.4-litre diesel is only offered with a 6-speed manual gearbox. The larger 1.6-litre turbo diesel unit comes paired with 6-speed manual or automatic transmission options and is the most powerful engine option on offer with the Creta. The engine churns out 126 Bhp @ 4,000 rpm and 260 Nm of torque @ 1,500 rpm. The Creta’s 1.6-litre diesel engine returns a mileage of 19.67 km/l with the manual gearbox option and 17.01km/l with the automatic transmission. 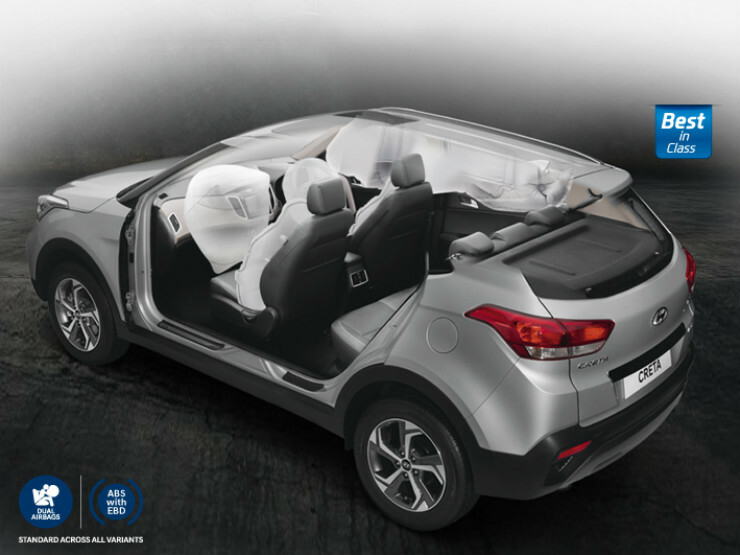 Hyundai packs the Creta with a host of safety features including multiple airbags (2 in the base variant that goes up to 6 in the top-spec variant). Other safety options found on the Creta include ABS, Hill-start assist control (HAC), Electronic stability control (ESC), Static bending lights (SBL) that bend light around a corner for better nighttime visibility, rear parking camera, anti-pinch power windows, and an electrochromic rear-view mirror that reduces the glare from trailing vehicles for safe nighttime driving. Over the years, Hyundai’s cars have proven to be extremely reliable and the Creta is no different. 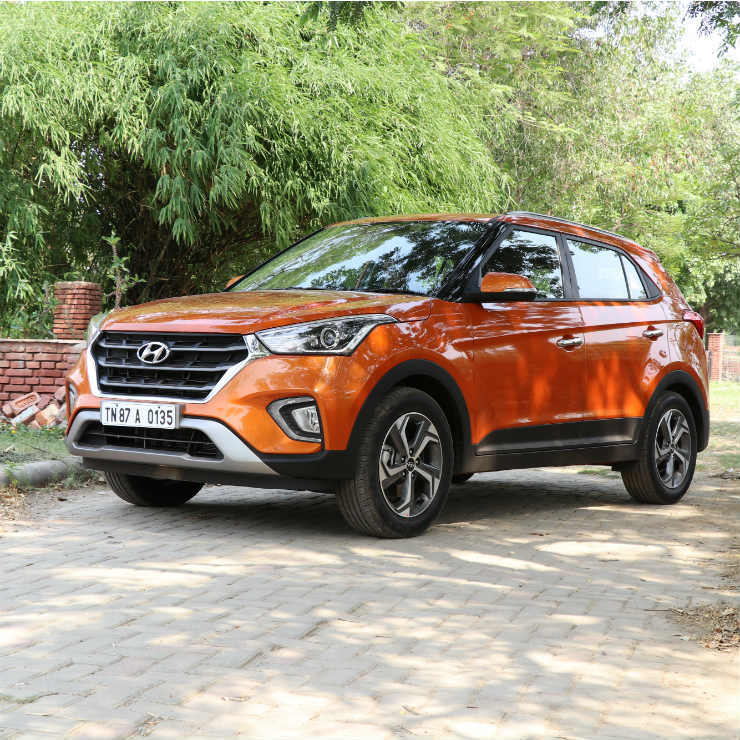 Also, Hyundai offers the Creta with a 3 years/unlimited kilometres warranty along with roadside assistance, which should take care of any unforeseen problems. 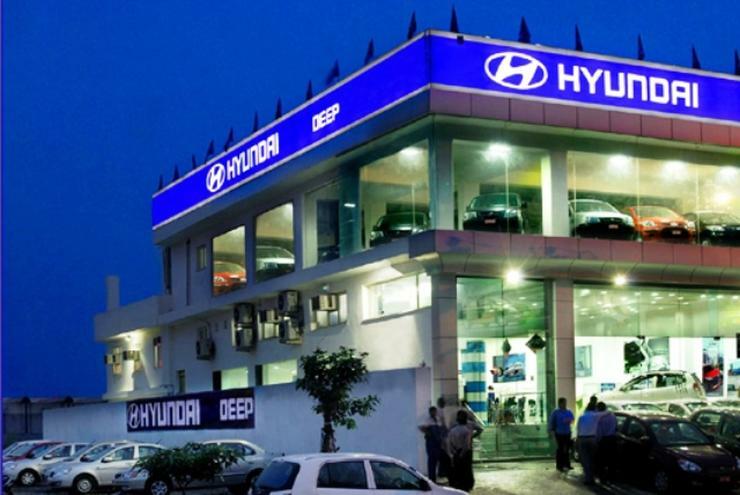 Hyundai has the second largest sales and service network in India among four-wheeler manufacturers after Maruti Suzuki. This means that potential Creta owners have a greater chance of looking at and test driving the Creta at Group 1 Hyundai. Creta’s metamorphosis was inevitable. If the SUV was a loner in its space when it made its debut in 2014, it faces tough challenges from a range of rivals. The Hyundai Cretahad to reinvent itself. Creta is the largest-selling SUV in India. Creta has about 4 lakh customers worldwide. A large chunk of them are in India, while the other major markets are South America and Europe. Creta, also known as IX25, is the latest SUV from the Hyundai stable. This is made for the younger generation. It is built on the i20 platform. Though the vehicle is meant for city drives, it is also game for a bit of offroading. Hive structure. The design stands for light weight without compromising on the strength of the body. The approach ensures top notch security and other attractions including fuel efficiency. The SUV is not a noise maker. It is a smooth drive. The Creta is a smaller version of Santa Fe, Hyundai’s noted off-roader. In fact, Creta could be mistaken for Santa Fe when viewed from the front because it swears by the Fluidic design that has come to represent all Hyundai cars. It is a scaled-down Santa Fe. No wonder Creta carries the image of a big vehicle. The new look grill gives it a fresh look. The other changes centre on the projector head lamp, daytime running lamp, diamond cut alloy, skid plate, tail lamp, side cladding, shark fin antenna and sunroof. The interiors have an elegant finish that resembles the European cars. Black dominates the colour scheme and the beige lines on the dashboard and the door trims give the car a special look. The seats are designed in such a way that they are easy to get in to. The SUV has standard ABS, ESP, airbags, A/C and power windows. The new additions include the electronically adjustable driver seat, cruise control, smart key band and wireless phone charger. Apart from the 1.6 gamma dual VT petrol engine with a capacity of 123 PS and the CRDI diesel engine with a capacity of 128 PS, Creta comes with a 1.4 CRDI diesel engine. We took the models carrying the 1.6 engines for a test drive. Creta is a pleasant drive, thanks to the engines that run silently and without trembling. The six-speed gearbox and power make Creta a driver’s car. The automatic model is remarkable. It is an easy drive. Creta did not waver on the Hyundai test drive track at top speed and while cornering. The SUV offers comfort too. The price tag has not gone up significantly with the new changes. Find out more about the new Cretaand visit your nearest Group 1 Hyundai dealership. A plethora of features it may not have; and neither does its strength lie in its safety amenities. But what it lacks for modern conveniences, it more than makes up for performance and efficiency, because at the end of the day, the used Hyundai Accent hatchback doesn’t just walk the talk—it drives with a punch. One look at the Hyundai Accent hatchback and you’ll notice its difference from the sedan version–it’s smaller, sportier, and quite attractive to look at. Sharing the same ‘Fluidic Sculpture Design’ language as other models in the Hyundai lineup, this basically means that the design is meant to make the lines softer and harmonious so they are more aerodynamic. Now, here’s where the Hyundai Accent shines. Highly-responsive and fast, this hatchback handles and drives well, and feels right at home on metro roads with–or without–traffic. This is especially true with its higher variant: the CRDI GL 7-speed Dual Clutch Transmission (DCT). Highly versatile, not only does it offer smoother shifts and dynamic acceleration when driven fast on highways, you also won’t have to burn your calves using the clutch pedal whenever you shift gears. That way, you don’t get easily tired while driving. This is extremely helpful when you’re stuck in heavy traffic. Hyundai’s penchant for anti-third millennium amenities extend to convenience and comfort. Nothing stands out here–except how standard everything is. The air conditioner is manual, and the seats are covered in fabric. Really, even the audio system is standard–a single DIN Radio with CD/ MP3/USB/AUX and 4 speakers. Actually, it’s okay, but if you want the best sound system, then you need to look far(ther). Or the very least you can do is ask Hyundai to change it to a 2-DIN head unit so you can at least add in some powerful amps and more updated audio features. Barring the standard airbags and seatbelts, there are three safety features that they offer for its manual variant: Anti-lock brakes, Electronic Stability Control, and Keyless Entry. All these safety features transport us back to the ’90s or at the turn of the 21st century. There’s not even a semblance of the 21st century here–except perhaps its dual-clutch variant that offers a Hill-Start Assist System (which technically speaking, was a 19th century invention as well). This is another one of the Accent’s strengths: Good fuel efficiency–especially the manual variant. In fact, this car is part of the 2016 DOE’s Eco Run awardees, with an average fuel consumption of 25.64 km/L and ranking 8th in its segment. Under the hood is a powerful 1.6-liter CRDi GL Six-Speed (for its Manual Transmission) and a 1.6 CRDi GL Seven-Speed (for its Dual-Clutch Transmission). Maximum power for both variants is 134 hp, and the torque–which is quite impressive–is at 260 Nm (for the manual variant) and 300 Nm (for the dual clutch transmission variant). That’s some good pulling power coming from such a small vehicle measuring 4,115 mm x 1700 mm x 1457 (LxWxH). Fuel capacity, however, is 43 liters, which falls a bit less than the standard 45. Still, that won’t be a problem, especially because the Hyundai Accent engine is designed for fuel-efficiency. 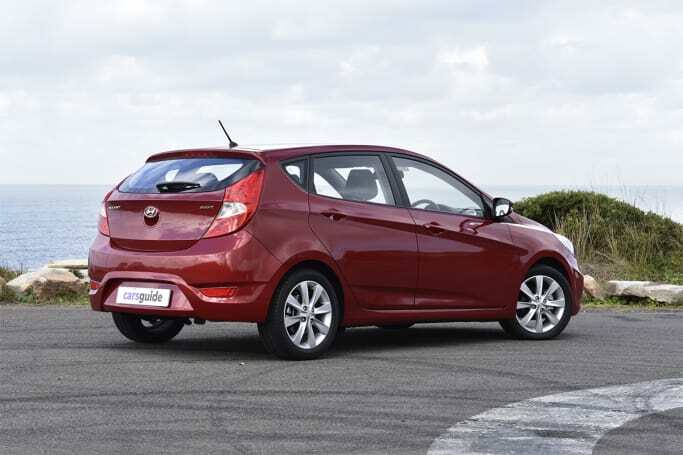 The Hyundai Accent is for practical drivers who want a car that offers great performance and excellent fuel economy. Test drive a new or used Hyundai Accent at a Group 1 Hyundaidealership near you! Hyundai is finally hitting a sweet spot that would have been hard to imagine just a couple of years ago: SUV sales now represent about half of the brand's U.S. sales volume. Led by a new version of its mid-sized Santa Fe and a refreshed version of its compact Tucson utility, Hyundai's SUV sales in September grew by 17 percent over a year earlier as the automaker finally seems to have put its biggest long-time weakness -- an over-reliance on sedans at the expense of utility vehicles -- behind it. Hyundai also has begun supporting the new Santa Fe with a TV-advertising campaign that demonstrates how the vehicle's capabilities suit the millennial families who are depicted driving it: plenty of flexible cargo space, for instance; a dual-row panoramic sunroof so the kids can see the natural splendor of America as they drive through it; and safety features that, in turn, keep the family from running into a moose (Forward Collision-Avoidance Assist) and also prevent a young boy from having a parked Santa Fe's drivers-side passenger door ripped off its hinges by a passing car (Safe Exit Assist). "We've got every base covered now," Dean Evans, Hyundai's chief marketing officer, told me. "This is the year of the SUV for us." Sales of used Santa Fe are a bit behind last year's levels as Hyundai continues to fill retail pipelines with the new version. Tucson sales are vastly outstripping year-ago levels as the overhauled model has moved into second place behind the Elantra sedan in Hyundai's ranking of best-selling vehicles. "Santa Fe is a combination of a rugged vehicle and a family hauler, which is what this segment needs," Evans said. "And with its Facelift, Tucson is in a sweet spot in the market too." Santa Fe accompanies six or seven passengers and is available in all-wheel drive, per its new advertisements that feature some off-roading -- and per expectations of millennial consumers. It's driven by a 3.3-liter V6 engine that yields 290 horsepower, and a six-speed automatic transmission. Handling and ride comfort are of the quality you'd expect from a car-based crossover, though Santa Fe still provides good human and cargo capacity. The second row feels roomy, and the seats recline and move back and forth, a rare feature in mid-size SUVs of any sort. The third row -- like most in the segment -- is tight for adults. 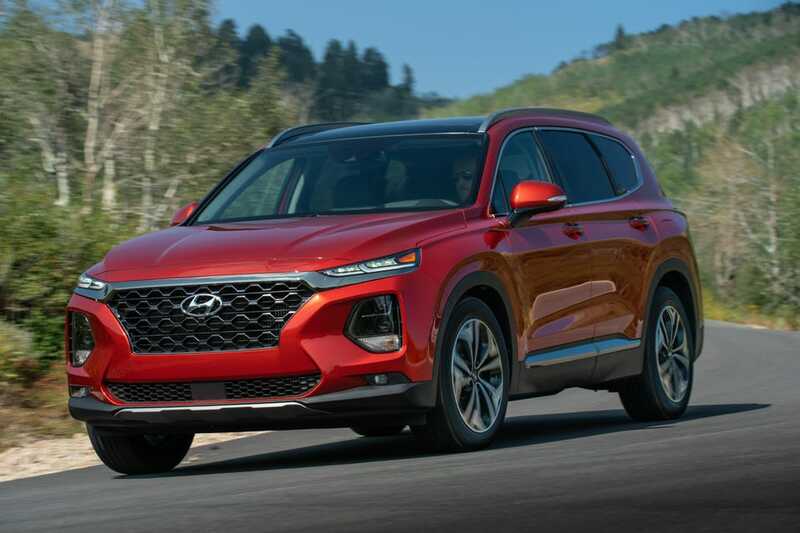 Hyundai is hailing an award for the 2019 Santa Fe of a spot on the new Ward's 10 Best UX list, a competition that drills deeply into user experiences in driver-assist technologies, connectivity, navigation, voice-activated systems and intuitive controls. Find a used Santa Fe for sale at Group 1 Hyundai, that will suit your pocket and your lifestyle.